With 12 years experience in the universe of electronic signature, Universign is the result of the expertise of Cryptolog, a French actor of electronic signature software and timestamping. In July, the eIDAS European regulation will come into force, which is a major step in the regulation and marks the beginning of a new era of electronic trust. For Universign, which is already experiencing a strong growth over the past three years, this advance is also synonymous with new development prospects. Boosted by the harmonization of the European market, Universign expects to strengthen his platform of trusted services and accelerate his commercial development and market share. It is a reality: digital takes precedence over paper. Signed and then scanned a document has no legal value. By attesting to their validity, integrity over time and the identity of their signatories, Universign’s services allow electronic documents to acquire real legal value. Thus, Universign possesses all the French and European certifications required to confer this undoubted value on documents. On July 1st, 2016, the eIDAS regulation is introduced, which represents a major step forward for the electronic signatures. This text provides homogeneous recognition of the electronic signature and her probative value throughout the European territory. 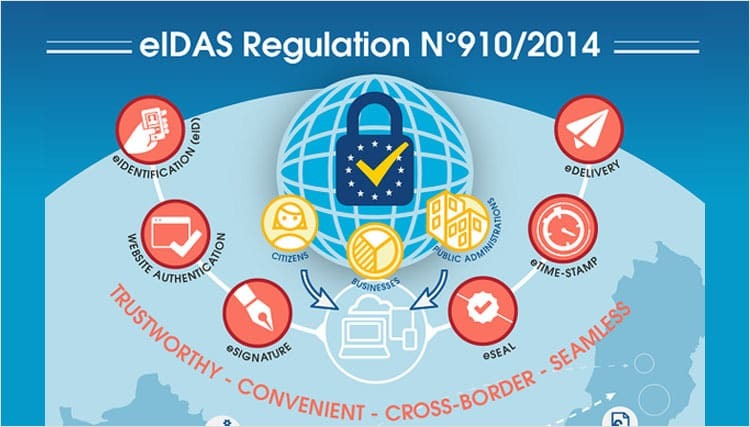 eIDAS mainly lays the foundations for a real digital trust market by specifying global rules with regard to simple signature and qualified signature. In addition, this regulation introduces two intermediate levels with an advanced signature and the advanced signature with qualified certificate. Pro-active, Universign anticipated these regulatory changes by adapting its SaaS platform in 2014 to propose the 4 levels of signature. As a pioneer in the field of cryptography and electronic signature with Cryptolog since 2001, the Universign solution was launched in 2007. Specialized in dematerialization with probative value, this SaaS platform makes it possible to sign and sign any type of Digital document. Easy to use, this powerful and secure tool offers 3 trusted services : the physical signature of the physical person, the server stamp and the timestamp. Everyday useful services for companies of all sizes and for multiple use cases : integrating the electronic signature into a website makes it possible, for example, to subscribe to a mutual health insurance or subscription to a newspaper, without breaking point in the sales cycle. Internally, job promises and contracts of employment, purchase orders or even framework contracts suppliers can be managed entirely dematerialized directly in the information systems type ERP, CRM or SIRH. The use of the server cache facilitates the mass signature of dematerialized documents on behalf of a person. “Trust is an indispensable element in the development of new digital uses. The eIDAS regulation finally brings common and homogeneous rules while simplifying the process of signature and the issuance of a digital identity. This is a new context favorable to Universign to combine “security” and “confidence”. Our service platform is, in this way, positionat as the facilitator who brings the balance between the democratization of uses and the securing of transactions, explains Julien Stern, founder and president of Universign. Over the past three years, Universign has increased its turnover by more than 30% per year and exceeded 600 customers. In this dynamic, the company decided to open new premises at the heart of the “Silicon Sentier” in Paris and to integrate 15 new employees into the team. Encouraged by this growth, Universign’s objective for 2016 is to strengthen its commercial development and therefore its market share. By positioning itself as the benchmark of digital trust in Europe, Universign aims to increase its turnover by more than 40% in 2016. Since January, sales, marketing, Customer Success and IT teams have been strengthened. To meet this promising growth, the company expects to expand its team of about ten additional employees in the second half of 2016 in all departments of the company.